Absolute Bites Kangaroo series are packed with antioxidants omega 3 and B12 vitamins – the most non allergenic meat that’s perfect for sensitive stomach and allergies prone dogs. Low in cholesterol and fat and high in protein and minerals. 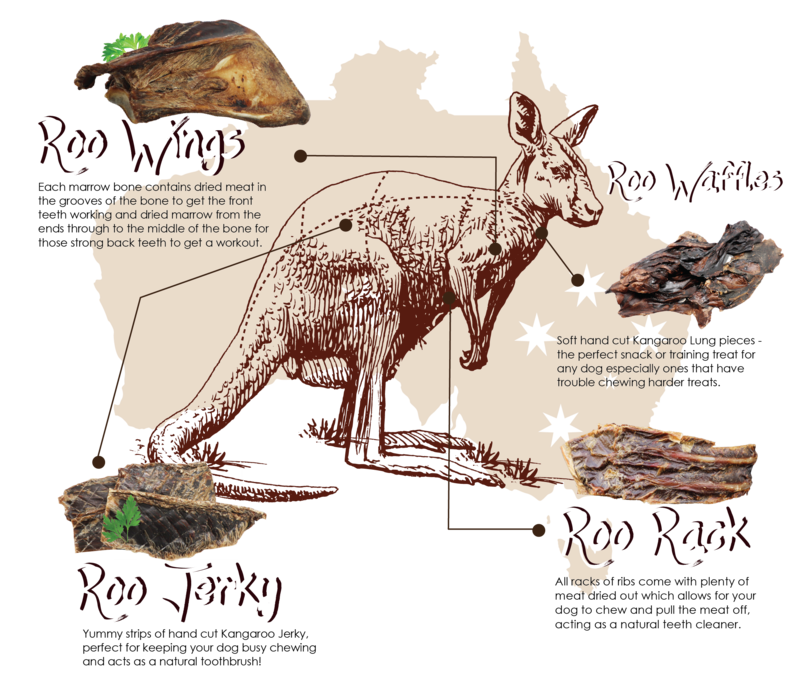 Kangaroo has the lowest fat content among all meat treats (less than 2%) and the highest level of antioxidants NEARLY 5x more than any other treat. 100% naturally air dried over several days to ensure the products retain their high nutritional value and quality. Yummy strips of hand cut Kangaroo Jerky, perfect for keeping your dog busy chewing and acts as a natural toothbrush! Soft hand cut Kangaroo Lung pieces – the perfect snack or training treat for any dog especially ones that have trouble chewing harder treats. Each marrow bone contains dried meat in the grooves of the bone to get the front teeth working and dried marrow from the ends through to the middle of the bone for those strong back teeth to get a workout. Should help keep any dog interested and great for their teeth and gums. Soft and crunchy bite-size cubed beef lungs that’ll provide ease of chewing among puppies and senior dogs. With a gentle aroma that’ll get your dog hooked. Nearly fat-free too! Absolute Bites Kangaroo series are packed with antioxidants omega 3 and B12 vitamins – the most non-allergenic meat that’s perfect for sensitive stomach and allergies prone dogs. 100% naturally air and freeze-dried over several days to ensure the products retain their high nutritional value and quality.